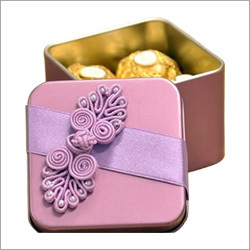 Chocolate tin box must be manufactured in different size that’s why it must be easily keep in different places. It should be manufactured in good metal so that it will be strong. It should be cheap and reliable. The metal which will be use to make the chocolate tin box should also in a good quality. The size of chocolate box must be as comfortable as you can carry in your pocket and bags. Price of the chocolate box must as an average person can also buy it. So that it will be help you to increase your business.